As we have planned, at the beginning of a new month we publish a resume on the events and accomplishments made over the last month. Important work has been done from the technical and social sides. Here are the most significant ones. -	The members of the ecosystem its essential part. To bring new sellers to the platform, we launch referral program. Now everyone who brings farmers to FoodCoin Ecosystem, will be rewarded for this valuable effort. It is important to explain to people how implementation of blockchain into their supply chain can make their work easier. The team is also preparing showcase material to members who request it. Moreover, people who refer us large businesses can receive additional bonuses if they contribute in making partnership contracts. -	However, we don’t want our community to be responsible for attracting new members. That is why we started collaborating with Innovations TV led by US actor, director and environmentalist Ed Begley, Jr. This episode will broadcast in 3rd quarter of 2018 on the largest TV networks in US and over the world. These are FOX Business, Travel Channel, Voice of America, RFD TV, Discovery Channel, and CNN. Total audience of these networks comprises nearly 447,000,000 subscribers. This is not the only episode which FoodCoin will participate in, because the education is a big and thorough work. -	Sellers are an important part of the ecosystem, but not least are the buyers. One of the US buyers’ clubs, Grassfed on the Hill founded by Liz Reitzig in Washington, DC area, has made a big purchase on 1000ecofarms using FoodCoin tokens. This club has been operating for over 5 years and has more than 300 members. The club plans to keep collaborating with FoodCoin and 1000ecofarms because their joint efforts will help them to be more effective. People talk about FoodCoin, and the materials about it appeared in several resources. Another German cryptocurrency resource Coincierge.de has published an article about FoodCoin. 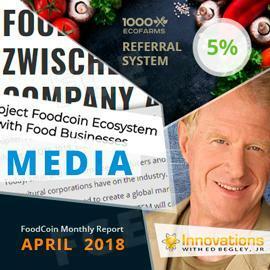 In addition to partnerships with ALDIM GmbH and The Turmeric Company, it also highlights the collaboration with Innovations TV series led by Ed Begley, Jr.
Stay tuned for new cool news and publications about FoodCoin! -	Added improvements on the FoodScan functionality. -	Testing and deploying the operational scheme in private network.